Roxy in Enchantix. . HD Wallpaper and background images in the Winx Club club tagged: winx club enchantix. This Winx Club photo might contain motif cachemire and paisley. I <3 IT.SHE LOOKS AWESOME. Do you mean, you posted it before she did? Uh-no honey, she posted this seven months ago. You weren't even a member of Fanpop, seven months ago. shw has very nice wings after aisha ofcourse! <3 the out fit, I think it is very her. How did u get that. Roxy doesn't have her enchantix yet!!! She would never get her Enchantix, because she already has her Believix. She wouldn't get her transformations the other way around. 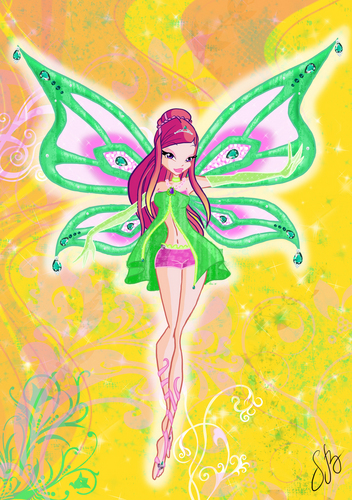 She would probably move onto the new transformations, Harmonix and Sirenix. Oh, and she looks awesome. I hope the new transformation for her will be similar to this. It'd be awesome if it was the complete same as this!